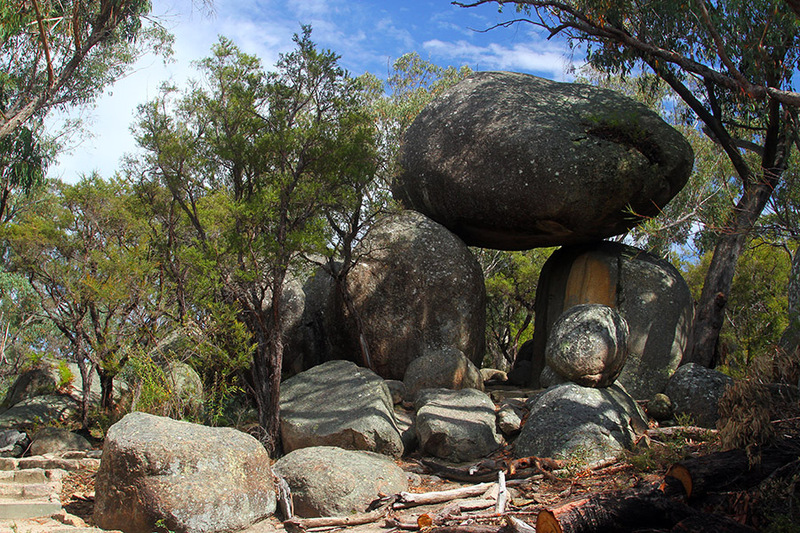 When I dropped in at Girraween National Park in October, 2014, I knew immediately that my two days there weren’t going to be enough, so when I headed north again in late October the following year, I booked five nights at the Murray Gardens Motel in Stanthorpe to give myself three full days to delve deeper into this amazing wonderland nestled in southern Queensland’s Granite Belt. My previous visit was spent getting to know the place and exploring some of its tracks, so my time was divided between standing in awe of the incredible scenery and trying to photograph some of the park’s invertebrate wildlife. This time, however, I went about things a little differently. Whilst I still got in a few good walks and had time to appreciate my surroundings, I spent a lot more time in search of insects and spiders, carefully scrutinising small patches of vegetation, sometimes staying in one spot for a couple of hours. My patience was well rewarded. 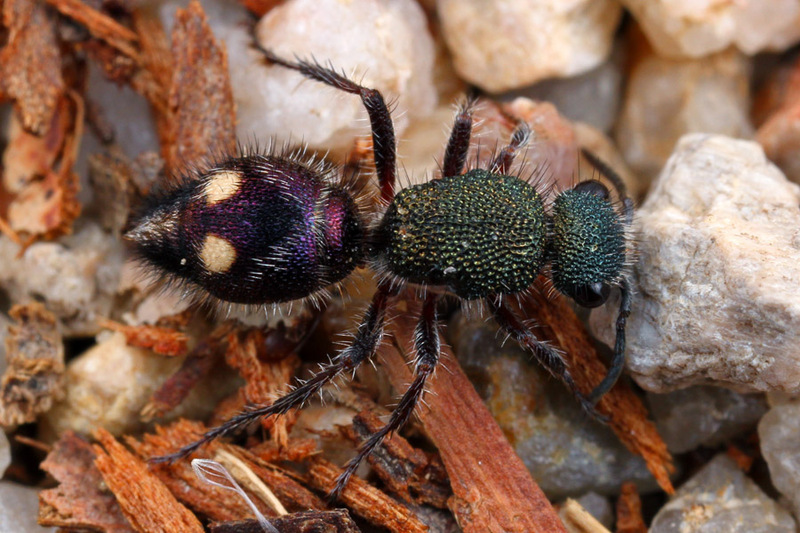 A stunning female wasp from the family Mutillidae, commonly called Velvet Ants. The timing of my visit was pretty much spot on. It had been fairly dry throughout September and most of October, but then there were a few good dumps of rain during the week leading up to my arrival. This encouraged a number of plants to flower, of particular note being a couple of the Leptospermum species (Tea-tree). It was in a few small patches of these sweet-smelling plants that I had the most success and some of the insects that stopped to feed on the nectar were the living definition of beauty. Unlike last year, conditions were much cooler and it was overcast most of the time with a few heavy showers and thunderstorms, but despite my initial concerns that this would mean there were going to be fewer insects, it actually worked in my favour. The insects were still keen to get in on the feast while the opportunity presented itself, but the cooler temperatures seemed to make them a little more docile, so I was able to get very close to some creatures that would normally have taken flight at the mere sight of me. It was a macro photographer’s dream! 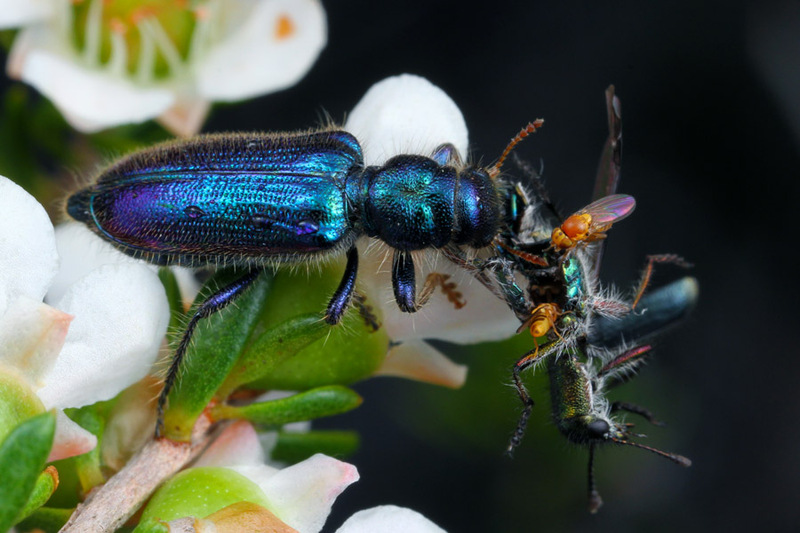 A Phlogistus species, one of the predatory beetles from the family Cleridae, devouring another Clerid, an Eleale species. Note the tiny flies helping themselves as well. There were so many new insects to record, but without doubt the highlight was the Jewel Beetles. Typically, I might find 4 or 5 species of Buprestids during the course of a season (not for lack of trying, I can assure you), but I smashed all records in Girraween, racking up an impressive 18 species over the course of 3 days (a quick census on one of those days revealed 14 species hanging around a few square meters of Leptospermum). Fifteen species were from the genus Castiarina and most of them were new to me, so I was in heaven, surrounded by a kaleidoscope of colour. 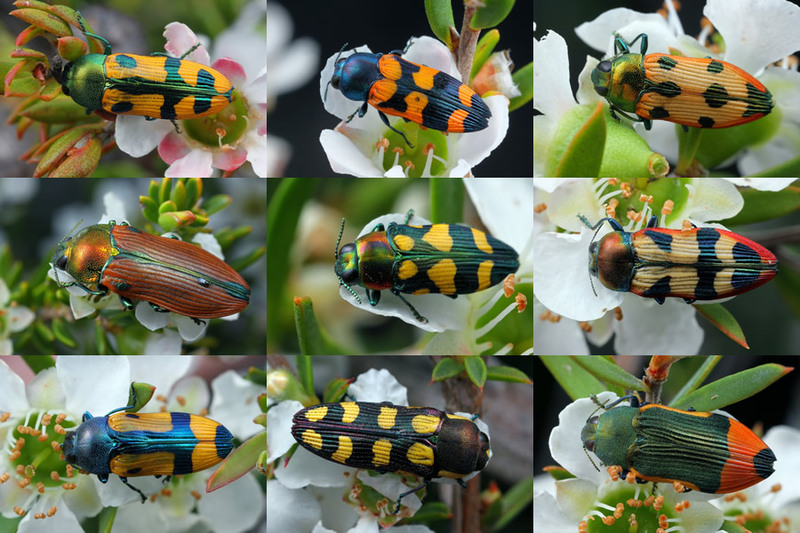 Nine of the Castiarina species. 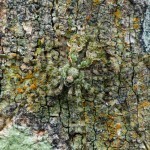 Top row, left to right – C. scalaris, C. livida, C. haswelli. Middle row, left to right – C. jucunda, C. cydista, C. punctatosulcata. Bottom row, left to right – C. skusei, C. decemmaculata, C. kerremansii. 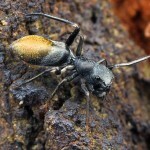 Needless to say, I wasn’t all that keen to leave Stanthorpe because I knew there was so much more to see, but all good things must come to an end and I had other places to go and, as it turned out, many other intriguing insects and spiders to photograph. Stay tuned for those stories. 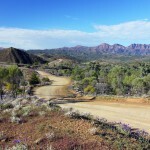 Please visit the image galleries to see the remarkable creatures of Girraween. I have included searchable tags, so if you go to the galleries and search for “insect Girraween” or “spider Girraween”, you will see a whole host of amazing invertebrate fauna. But if you ever get the chance, go to the park yourself because I’m sure I have missed a few.